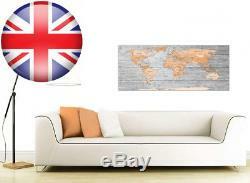 Large Orange Grey Map of World Atlas Canvas Wall Art Print - Modern 120cm Wide - 1304 Wallfillers. Package Dimensions: 130.2 x 51.3 x 3.3 cm. PERFECT SIZE FOR OVER SOFA or BED - Dressing your room to impress? Then why not let this huge XL 120cm x 50cm piece of contemporary art provide that cool stylish finishing touch to your home? The last piece of the interior jigsaw, so you can finally achieve that trendy designer decor look, with your pictures perfectly matching and accenting your curtains, blinds, rugs, & accessories, just like in the glossy magazines! EASY & QUICK TO HANG - Our entire range of Canvases are supplied stretched and ready to hang, simply place over a nail or screw and your beautiful framed art print will sit securely, making it a simple & quick process for you to decorate any of your Rooms, Hallway, Landing or Extension. GIVE YOUR WALLS THE WOW FACTOR - Say a big "No" to blank walls... And pamper your living room or bedroom with this classy cool centrepiece, and watch how it completes the room, as well as painting smiles and admiring glances on the faces of your friends & visitors, who will envy the stylish way that your art now effortlessly complements your wallpaper and cushions. An Extra Large Orange Chic Canvas Wall Art. 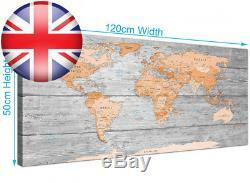 Supplied direct from WALLFILLERS, the UK's best loved canvas wall art gallery. Our images are made to the highest standards with fade proof inks. Framed to studio specifications and stretched with precision over a solid wood frame. Ideal width for over your sofa. ADDS colour and style to ANY room. 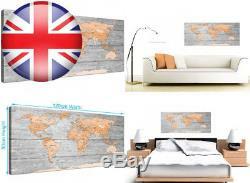 Measurements: 120cm wide x 50cm high Canvas Wall Art is the modern way to brighten the walls of your home and we are confident that you will be extremely pleased with your canvases. The item "Large Orange Grey Map of World Atlas Canvas Wall Art Print Modern 120cm" is in sale since Tuesday, June 26, 2018. This item is in the category "Art\Art Prints". The seller is "clearance-itemsuk" and is located in GB. 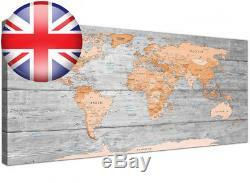 This item can be shipped to United Kingdom, Antigua and barbuda, Austria, Belgium, Bulgaria, Croatia, Cyprus, Czech republic, Denmark, Estonia, France, Greece, Hungary, Ireland, Italy, Latvia, Lithuania, Luxembourg, Malta, Netherlands, Poland, Portugal, Romania, Slovakia, Slovenia, Spain, Sweden, Australia, United States, Canada, Japan, New Zealand, Israel, Hong Kong, Norway, Indonesia, Malaysia, Mexico, Singapore, South Korea, Switzerland, Taiwan, Bangladesh, Belize, Bermuda, Bolivia, Barbados, Brunei darussalam, Cayman islands, Dominica, Ecuador, Egypt, Guernsey, Gibraltar, Guadeloupe, Grenada, French guiana, Iceland, Jersey, Jordan, Cambodia, Saint kitts and nevis, Saint lucia, Liechtenstein, Sri lanka, Macao, Monaco, Maldives, Montserrat, Martinique, Nicaragua, Oman, Pakistan, Peru, Paraguay, Reunion, Turks and caicos islands, Aruba, Saudi arabia, South africa, United arab emirates, Ukraine, Chile, Finland.